This is a recipe I first tried several years ago at a friend’s house. She served it as a side dish and it was delicious. Place the fruit in a 2 quart casserole dish. Melt the butter in a small saute pan, add the brown sugar and curry powder and simmer until the sugar has melted. Pour over the fruit and mix well. This recipe is very versatile. * You could use firm canned fruits, probably even fresh fruits. The frozen fruits come in an assortment of varieties, so choose your favorites. 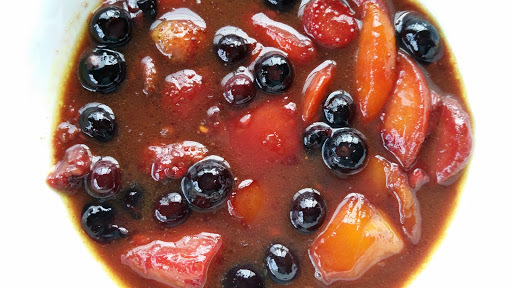 You could also double the amount of fruit and have enough of the sauce without doubling that portion of the recipe. I served this as a side dish with burgers, but it would make a great simple dessert. Just top it with ice cream or whipped cream. It would also work well as a pie or cobbler filling for something a little different.